Preposition Examples test is below here. you should attempt everyday Preposition Examples Test . 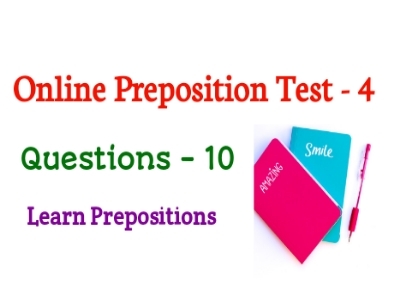 If you want to learn Prepositions online, then you must visit our blog daily. Also you are students or, Job Seekers, then this post is very useful to you. Choose the below correct answer and Press ' Submit' Button to Show your result. It may rain __ any moment. He Died __ the age of Eighty. She is working __ the Oven. I have not seen you ___ years. He took me ___ my Brother. The plane flew ___ the USA. Divide these oranges ____ the three boys. He is __ the committee. He came __ a Nobel family. What do you think __ me?